Make sure that all passengers have their hands, etc., inside the vehicle before closing the liftgate. 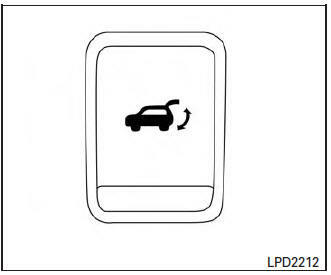 NOTE: To open, close or reverse the power liftgate, the shift lever must be in P (Park). Also, the power liftgate will not operate if battery voltage is low. The power liftgate automatically moves from the fully closed position to the fully open position in approximately five – eight seconds. The power open feature can be activated by the switch on the keyfob, the instrument panel switch and the liftgate open switch. The hazard lights flash and a chime sounds to indicate the power open sequence has been started. 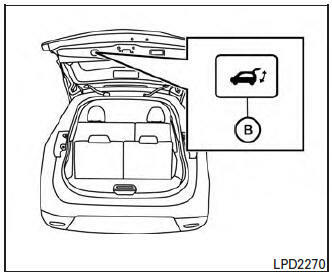 When vehicle is locked, the liftgate can be opened by the instrument panel switch, keyfob and liftgate open switch A (with keyfob in liftgate range). The keyfob button must be held for 0.5 second before the liftgate opens. The liftgate must be unlocked to open it with the liftgate open switch A and without keyfob in liftgate range. The liftgate open switch A can only be used to open the liftgate if the MAIN switch (located in Instrument Panel) is in the ON position. A warning chime will sound if the shift lever is moved out of P (Park) during a power open operation. The power liftgate automatically moves from the fully open position to the secondary position. When the liftgate reaches the secondary position, the cinching motor engages and pulls the liftgate to its primary latch position. Power close takes approximately seven – ten seconds. The power close feature can be activated by the switch on the keyfob, the instrument panel and the liftgate close switch B . The hazard lights flash and a chime sounds to indicate the power close sequence has been started. If the liftgate open switch A is activated while the cinching motor is engaged, the cinching motor will disengage and release the latch. The keyfob button must be held for 0.5 second before the liftgate closes. The liftgate close switch B can only be used to close the liftgate if the power liftgate main switch is in the ON position. The power liftgate will reverse direction immediately during power open or power close if the keyfob, instrument panel or liftgate close switch B is pushed. A chime will sound to announce the reversal. If an obstacle is detected during power open or power close, a warning chime will sound and the liftgate will reverse direction and return to the full open or full close position. If a second obstacle is detected, the liftgate motion will stop and the liftgate will enter manual mode. 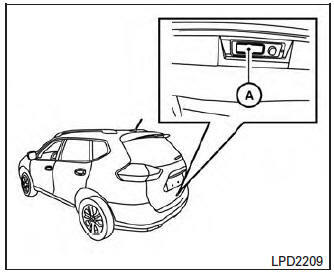 A pinch strip is mounted on each side of the liftgate. If an obstacle is detected by a pinch strip during power close, the liftgate will reverse direction and return to the full open position. NOTE: If the pinch strip is damaged or removed, the power close function will not operate. There are some small distances immediately before the closed position which cannot be detected. Make sure that all passengers have their hands, etc., inside the vehicle before closing the liftgate. Manual Mode: If power operation is not available, the liftgate may be operated manually. Power operation may not be available if the power liftgate main switch is in the ON position, if multiple obstacles have been detected in a single power cycle, or if battery voltage is low. If the power liftgate open switch A is pushed during power open or close, the power operation will be canceled and the liftgate can be operated manually. 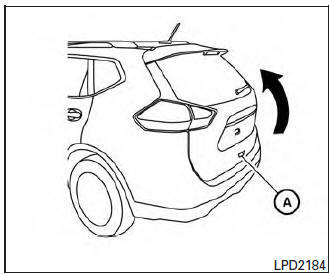 To open the liftgate manually, press the liftgate open switch A and lift the liftgate. To close, lower and push the liftgate down securely.